Dudley Hely took up sports car racing in his twenties driving a Frazer Nash Le Mans Replica and a Healey Silverstone at Goodwood and Silverstone between 1952 and 1956. Surviving records of race meetings that include Dudley amongst the competitors show a few where he finished on the podium. He also competed at the Firle Hill Climb events in East Sussex, and both Dudley and his father occasionally entered their Frazer Nash Le Mans Replica in races when it was driven by Tony Brooks. 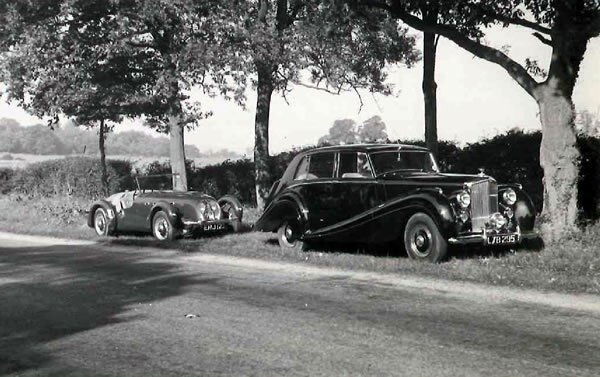 The photograph shows the family Bentley LXB 295 and the Healey Silverstone EHJ 123 raced by Dudley. Many thanks to Neil Collins for supplying all the photographs on this page. 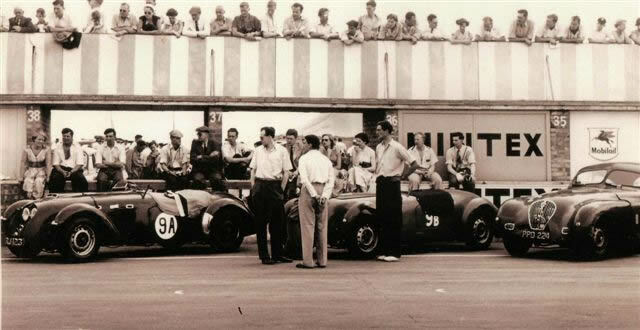 Dudley Hely is the tallest of those standing by the three sports cars. His Healey is 9A, on the left. 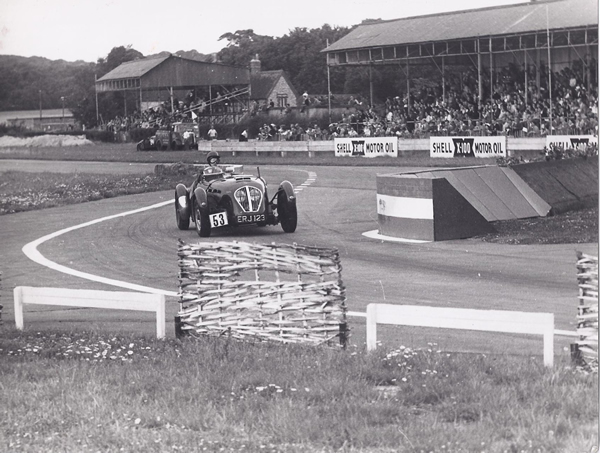 Dudley in his Healey Silverstone at Goodwood motor circuit in 1953. 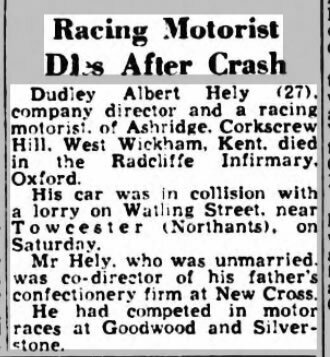 In May 1956 while he was driving his Healey Silverstone, Dudley was involved in a collision with a lorry on Watling Street, in Northamptonshire, and received serious injuries from which he died. The car was written off and abandoned for some 40 years until it was rebuilt. The above newspaper reports of the accident and inquest are from the Aberdeen Evening Express of 15 May and the Birmingham Daily Post of 14 June. It seems from his death certificate that the accident occurred on Saturday 12 May and Dudley died two days later in the Radcliffe Infirmary, Oxford. The cause of death was laceration of the brain due to a fracture of the skull. Dudley was the only child of Albert Edward Hely and Winifred May Hely, née Barrett. 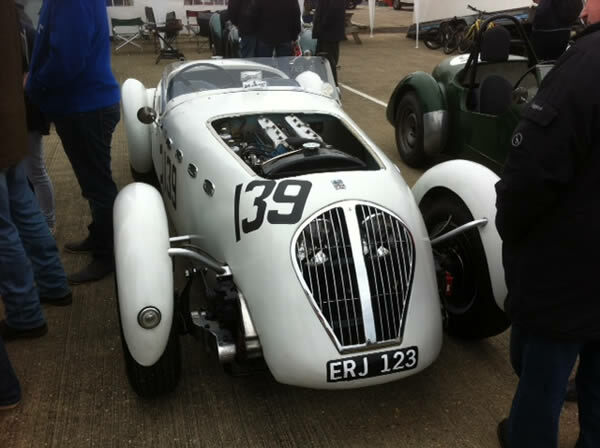 The rebuilt Healey Silverstone after its rescue some forty years after it was abandoned.